All giant hamburger kit's includes a DVD shows you step by step how to make the perfect giant hamburger. Let us show you how to make one of the worlds largest hamburgers in your kitchen. with our fun and easy to use giant hamburger kits. All kits include a how-to DVD shows you step by step how to make your favorite burgers party size. Order 16- inch and 12-inch kits. 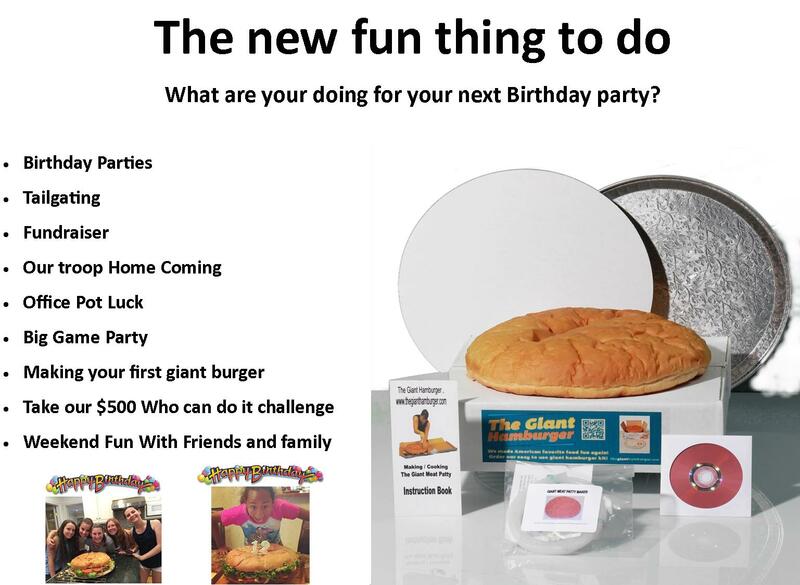 The Giant hamburger kit#2 Includes (2) Ready to use 16-inch giant bun (1) Giant meat patty, maker(1) 16 inch round serving tray (1) 16 inch round whiteboard (1) Step by step instruction book and a DVD shows you how to make and cook the giant meat patty. Jr giant hamburger kit. Includes (1) Ready to use 12-inch giant bun (1) Giant meat patty, maker(1) 12 inch round serving tray (1) 12 inch round whiteboard (1) Step by step instruction book and a DVD shows you how to make and cook the giant meat patty. The Do it yourself giant hamburger kit. With this kit you make and bake the hamburger yourself. Includes (1) DVD shows you step by step how to make and bake the giant a 16-inch giant bun. (1) DVD shows you how to make and cook the giant meat patty(1) Giant Meat Patty maker(2) 1lb bags of bun flour (2) packs of yeast (1) How to instruction book. This kit comes in a 12-inch giant hamburger kit also. visit our online store to order the 12-inch kit.